LSU, Mizzou, and Auburn were all ranked heading into action yesterday, and all of them lost. The first two were still paving their way toward a national championship while Auburn, who had already lost two games in-conference, was treading water in their own league, having fired their offensive coordinator in hopes that throwing him overboard would help right the ship. No dice. Chase Daniel played himself out of a victory (and possibly the Heisman) with three picks last night, while the Saturday diehards wait yet again for the polls to clean up the mess for the BCS. UNC 29, Notre Dame 24. The Irish were among the other carnage yesterday, who had looked like a team ready to get back on the national stage. Standing in their way of another quality win and almost certainly another Top 25 ranking was the Butch Davis juggernaut in Chapel Hill, who scored 13 unanswered points to take a lead they would not relinquish. Notre Dame's much-maligned quarterback Jimmy Clausen earned fair marks for his game (31-48, 383 yds, 2 TDs, 2 picks), a development that suggests Notre Dame could be in decent position to win their league. You know, if they were in one. Ohio State 16, Purdue 3. Man, Ohio State is boring. Terrell Pryor showed he's still learning the ropes of the Buckeye offense, as his unit went the whole game without finding the end zone. Apparently this is Joe Tiller's last season as head coach of the Boilermakers, and his quiet retirement parade will be even more overshadowed by his team's loss in Columbus yesterday. Florida 51, LSU 21. The Gators jumped ahead early and never looked back. 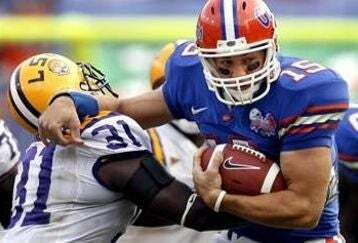 Tebow snipped the Tigers D with 232 all-purpose yards, and accounted for three TDs, two by air, and one on the ground. Percy Harvin caught for 112 and two scores as the SEC shows yet again why it's so damn hard to get out without blemishing one's schedule in the process. Texas 45, Oklahoma 35. Warrants mentioning again, since we didn't officially recap this game yesterday. An amazing game, one that found Texas making the plays to win down the stretch in Dallas. Colt McCoy showed that he's ready for his close-up, as he's as much a Heisman frontrunner as anyone now. After watching that game and listening to the coaches afterward, it was clear that the true winners on Saturday were fans of college football. Is That A Caterpillar On Your Forehead Or Is Your Team Still In The Playoffs? Yes, But How Does The Robot Do In The Shuttle Run?